August 11, 2015—It’s always nice to be surprised. Huntsville was a surprise to me. I don’t know what I expected—perhaps a southern city filled with antebellum mansions, like Charleston, S.C. (Huntsville is in the south!) Perhaps the city does have these types of homes, and maybe even remnants of plantations, but we did not see them. Instead, we found a clean, modern small city that was not congested with traffic. Sunday we drove into the city to visit the Welcome Center and get information about area attractions. The downtown area was quiet; most businesses were closed, including most restaurants. The Welcome Center was open from 12-5. We were early, so we stopped at a railroad museum up the street from the center. It was closed, but we walked around and looked into antique train cars and other memorabilia. 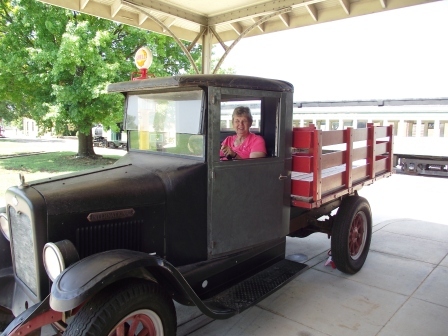 The railroad museum in Huntsville was closed on Sunday, but visitors could walk around the grounds and peer into the trains and other antique artifacts, such as this International Harvester truck. 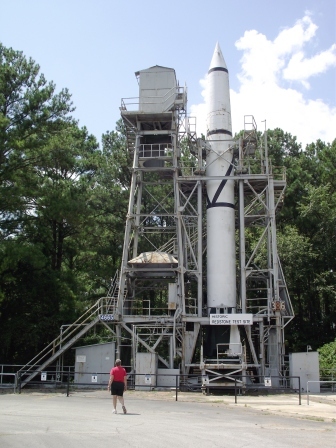 Our plans were to visit the Space Center on Monday, then go to the Unclaimed Baggage Center in Scottsboro on Tuesday. We were smart, however, and checked the weather on the way to the Space Center. Good thing: The forecast called for heavy thunderstorms, due to hit just at the time when we would be at the outdoor museum or on a bus tour of the Redstone Arsenal. So, we flipped our plans and headed to the Unclaimed Baggage Center. Both of us had heard of this “department store.” The company buys up all unclaimed baggage from airlines, opens suitcases, sorts and cleans contents, prices items, and displays them just like a discount store. You would be amazed at what goes unclaimed—from reading and prescription glasses to cell phones to household goods and, of course, clothes. Even underwear. I wondered, though, if all of the items were actually from unclaimed baggage, or does this store use that handle but buys up goods from other places? Some items appeared brand new. We both expected bargains. Not so. At least for the cursory shopping we did. I did not look at any women’s clothes, but I looked at price tags on many things, including cameras and electronics, such as computers and tablets and i-Pads. Anyone shopping at this store should do homework first and know what goods are going for new and used before buying. Our decision to visit the store on Monday and the Space Center on Tuesday was a good one. Just as we returned from the Unclaimed Baggage Center, the rain drops started to fall. Then we had a full-blown rain storm with winds up to 30 mph. Several RVers in the campground, including a couple out on their first camping trip in their brand new motorhome, lost their awnings to the wind. Today we headed back into Huntsville to tour the U.S. Space and Rocket Center, purportedly America’s largest space artifact collection. Jim had been there in the 1970s, but, of course, it was completely different today than it was back then. Rockets greet you from miles off. 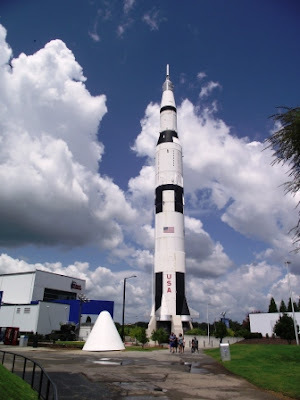 The Saturn V rocket, which took the astronauts to the moon, was (and still is) the biggest rocket. 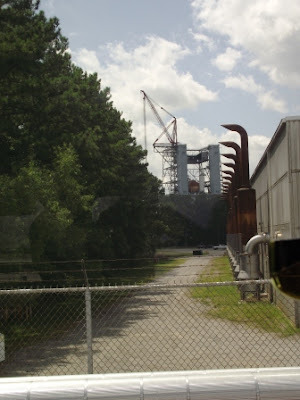 The Space Center has one standing tall as a 363-foot sentinel to the indoor/outdoor museum. Inside one of the buildings is another Saturn V rocket, mounted horizontally, so that you can see the three-stages of its components. The Space Center is where kids go to Space Camp. We were told that several hundred may be there at any one time. We saw several groups with their camp leaders touring the grounds. In addition to learning about the space program, including the shuttle program and the International Space Station, we enjoyed going on the simulators. One carried passengers up a tall tower and dropped them down. Another was like a carnival’s tilt-a-whirl—we experienced G-force. I did not care for this particular simulator, because it became difficult to breathe! The Saturn V rocket is huge! 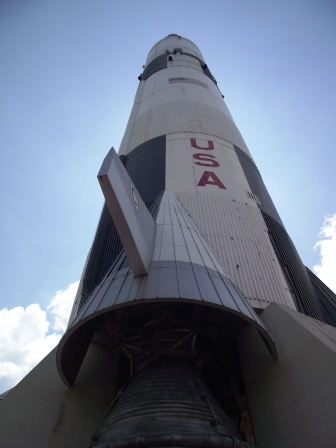 The Saturn V rocket does not look big from a distance, but it stands 111 meters tall. We also bought tickets for a tour of the George C. Marshall Space Flight Center, previously known as the Redstone Arsenal. This is where Werner VanBraun and his crew of German scientists developed the first rockets that propelled America into space. It is also the home to the International Space Station’s payload operations and integration center, which we saw in operation. Not much going on...but I guess the people in the center get paid well to handle things when there is an emergency. Our day ended with a trip to an award-winning Alabama barbecue restaurant in Decatur, a suburb west of Huntsville. 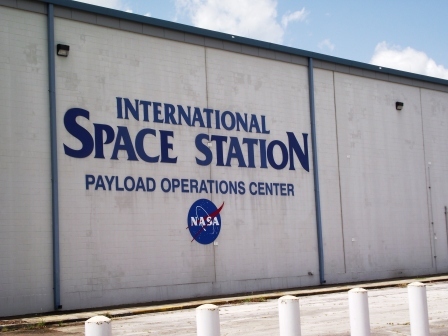 The tour of the Marshall Space Center included a visit to the International Space Station Payload Operations Center. 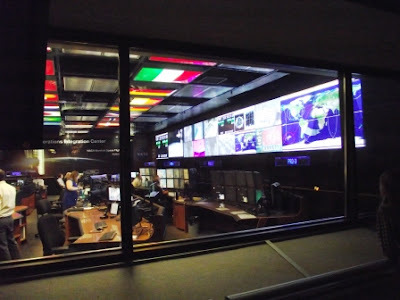 This is where engineers and other experts manage the payload operations of the International Space Station. They are in constant communications with the astronauts on the station. When Werner von Braun and his team of scientists and engineers designed the first rockets, called Redstone rockets, they tested the rockets at this stand. In the distance in the center of this picture is the test stand for the Saturn V rocket. When the engineers tests the five engines on the first-stage of the rocket, they fired them up all at once. It is said that the noise and vibration from the blast of these engines could be felt more than 200 miles from Huntsville. What a disappointment. We have eaten better barbecue at Monroe’s and Sticky Fingers in Jacksonville. The meat tasted very smoky, but the choice of sauces was limited. We had chosen to stay at this resort partially to be able to fish. It is on a huge man-made lake (Lake Guntersville), but the weather has been so hot that the fish have not been biting. We enjoyed the scenery, however. The area around Huntsville is gorgeous. Tomorrow we are headed toward Florida. We have decided to spend three nights in an RV park that is located directly on the gulf, and we have a front-row spot reserved for us. We will attempt fishing there. Whether the fish will bite is unknown, but I am sure we will have a restful stay. Thanks for all the background info on this interesting space museum. I've been watching The Astronauts Wives, and this looks like part of the show. I love the way you two explore the highways and byways, just stopping wherever something looks interesting.